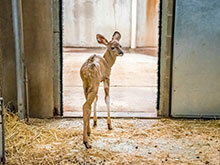 Kudu Calf, Noola, Born at the Zoo! 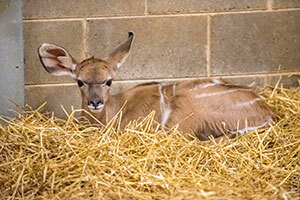 The Zoo is pleased to announce the birth of a female greater kudu! Noola was born April 1 to mom, Noeli, and dad, Barudi. Noeli and Barudi are seasoned parents, having had several offspring together in the past. Although the calf was a bit undersized at birth—weighing just shy of 25 pounds—keepers are happy to report that she is healthy and regularly gaining weight. Once full grown, female greater kudu typically reach between 300-400 pounds. Zookeepers decided to name the calf Noola, which means “jester,” in honor of her April Fools’ Day birthday. True to her name’s meaning, Noola has a very cheerful disposition yet is quite calm around keepers. They are interacting with her on a regular basis so that she becomes accustomed to essential care procedures, such as voluntary blood draws, in the future. Currently in a “hunker down” phase, keepers explain that Noola will remain off-exhibit for a period of time to allow her to bond with mom. Once she has bonded with and is reliably staying close to mom, she will go on exhibit to explore the Outdoor Yard with the other kudu. Unfortunately, wild kudu populations are declining due to hunting for their meat, hides and horns. In Africa, kudu horn—along with other animal horn, such as rhinoceros—is considered valuable and is commonly used as containers, musical instruments and symbolic ritual objects. Kudu numbers are also declining due to habitat loss resulting from human expansion and farming.